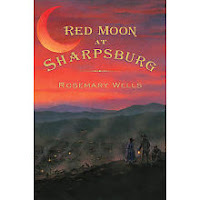 Red Moon at Sharpsburg by Rosemary Wells. Grades 6+. The story is set in Virginia during the Civil War. When we first meet our main character, India Moody is 12 years old. She'd rather run with the boys and play their war games than sit inside with the girls. She likes school and is actually disappointed when the school is shut down because their teacher goes off to fight for the Confederates. With school shut down and the war picking up speed, India's best friend moves north to Oberlin, Ohio where there is a college that accepts women. India begins studying with Emory Trimble, a scientist who shares his theories about bacteria and chemistry. India develops the hope that she will one day attend Oberlin College and study science. A lot of stuff gets in her way, though. First of all, she's a woman. No woman is going to be able to make a career out of science. Second of all, she's in Virginia and has no money to get to Ohio. Also, there's a war on. And despite the South's hopes that the war would be over in three months, it just keeps going on. There is much of interest in this novel. Emory's theory about the spread of infection and his scientific work to develop antibiotics. The struggle between the development of more sophisticated medicine and the older doctors who hang onto their bloodletting and leeches. The young Southern men who are compelled to join the army so they can hang on to their honor. And through it all, India holds on to her hopes and dreams. This is a sprawling novel, continuing through much of the Civil War in just about 250 pages. I thought parts of it felt a little disjointed and I wished that I could have seen India's character grow and change a bit more gradually. But there's no denying Ms. Wells's beautiful turn of phrase. When India and her mother are talking about why India's father had to join the army, Mrs. Moody says, "'Seems to me... the whole town's worth of men just dropped their plows and pencils and walked into the army like flowers turning to the sun.'" (p.32) It captures the feel so perfectly... all the men suddenly caught with War Fever and running to enlist in the war that will only take three months to win (so the Southerners thought...). I do like Civil War books (inexplicably, seeing as I dropped the one Civil War class I tried to take in college). And I liked this book. It's one that will stick with me for a long time, I think. As far as readalikes go... I would hand over A Northern Light by Jennifer Donnelly for another historical story about a plucky young woman determined to go to college despite the odds. For more on the Civil War, maybe Annie Between the States by L.M. Elliott. It's on Anderson's Mock Newbery list and it's been reviewed by Reading Rants and it's a Cybils nominee for YA fiction. Good review. I read the book and I loved it. Good review! I liked the book, though the ending seemed a bit abrupt. I have to write these review/skits of like 4 characters from the book and I'm having trouble. Does anyone have any advice?